A no-deal Brexit plan - in which one side of a motorway will be reserved for queuing lorries - will begin on Monday. HGVs heading to the Port of Dover will use the coast-bound side of the M20, while all other traffic will be restricted to a contraflow system on the opposite side of the motorway. It was designed to tackle disruption caused by delays at the border. 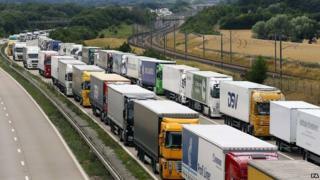 Highways England said it will keep "traffic flowing for people living, working and travelling" in Kent. It said the measures will "help to demonstrate Kent's preparedness for disruption" and may be suspended if they are "assessed as unlikely to be required in following weeks". John Kerner, of Highways England, said the plan, known as Operation Brock, provides "a safe, scalable response to disruption that can be used to queue up to 11,000 lorries heading for mainland Europe". It comes as Dover Harbour Board chief executive Doug Bannister warned that queues could reach 17 miles if it takes an extra two minutes to process each vehicle. Operation Brock will begin at 06:00 GMT on 25 March, with final preparations taking place on the M20 and M26 over the weekend, Highways England said. The contraflow system will be in place from junction 8, near Maidstone, to junction 9 at Ashford, with a 50mph speed limit in place. Under the plan, hauliers may be sent to a lorry park at Manston Airport and the M26 may also be closed and used to queue HGVs in the event of severe disruption. The government has given Kent County Council £28.8m to improve Manston, to strengthen the roads around it and for new signs and traffic signals. Up to 6,500 HGVs could be held at the airport, with drivers issued tickets that will need to be presented at checkpoints. "If a driver does not possess a ticket, they will be turned around," the council said.